The rock-cut facade is decorated with two groups of colossi that are separated by the large gateway. The statues, slightly more than ten meters high, are of the king and his queen. On either side of the portal are two statues of the king, wearing the white crown of Upper Egypt (south colossus) and the double crown (north colossus); these are flanked by statues of the queen. As the larger temple dedicated to the king, the hypostyle hall or pronaos is supported by six pillars; in this case, however, they are not Osiris pillars depicting the king, but are decorated with scenes with the queen playing the sistrum (an instrument sacred to the goddess Hathor). The hypostyle hall is followed by a vestibule, access to which is given by three large doors. On the south and the north walls of this chamber there are two graceful and poetic bas-reliefs of the king and his consort presenting papyrus plants to Hathor, who is depicted as a cow on a boat sailing in a thicket of papyri. The small sanctuary with bas-reliefs on the side walls depicting scenes of offerings to various gods made either by the pharaoh or the queen. 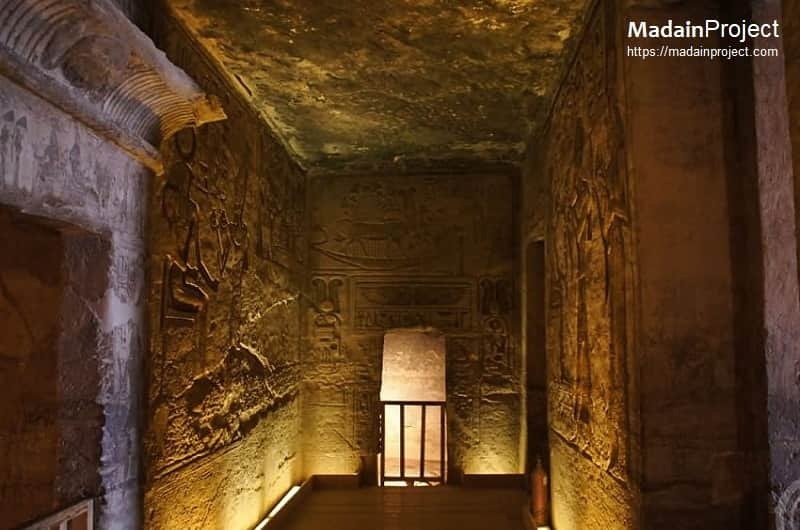 On the back wall, which lies to the west along the axis of the temple, there is a niche in which Hathor, as a divine cow, seems to be coming out of the mountain. The goddess is depicted as the Mistress of the temple dedicated to her and to queen Nefertari, who is intimately linked to the goddess. An aerial view of the two temples with the lesser temple of Nefertari and Hathor in foregroud to the right with Great Temple of Ramesses to the left in the background. 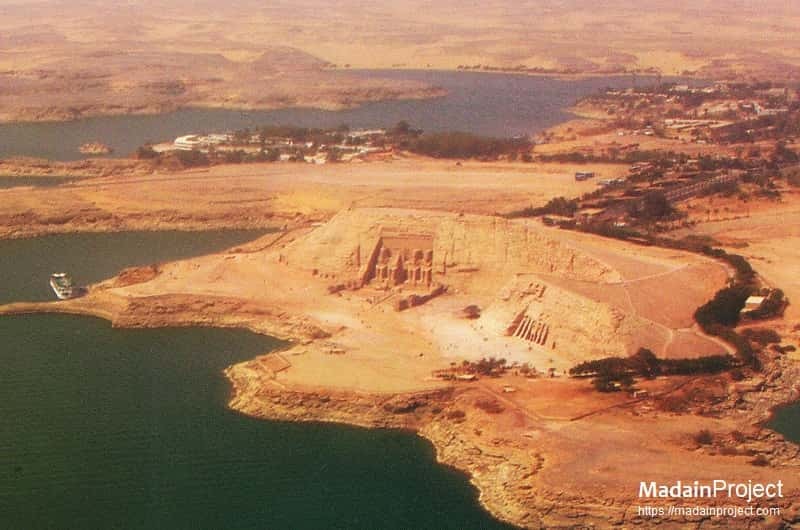 The modern water levels of Lake Nasser can be seen in the lower left corner.